When crea­ting ePub‐​files I often got an error mes­sa­ge from apple: Image exceeds 2 mil­li­on pixels. I did not find any rea­dy to use solu­ti­ons to this pro­blem. 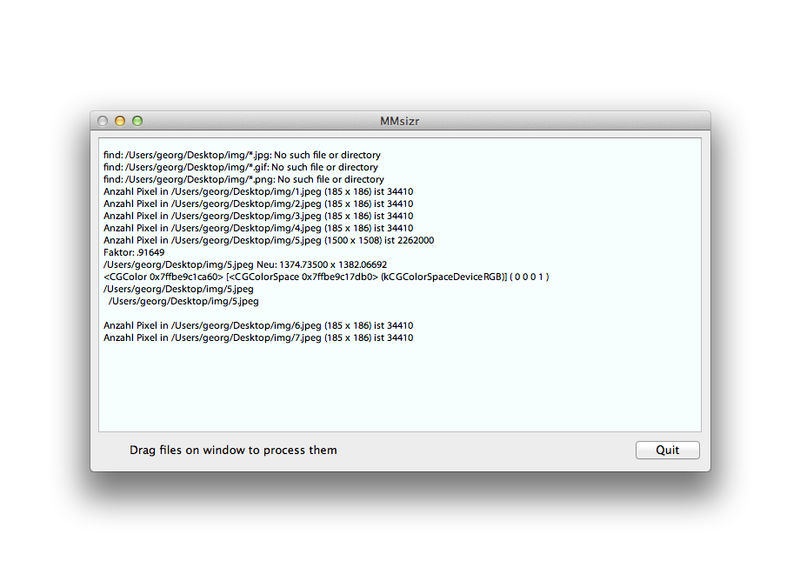 A fri­end of mine an I crea­ted this shell script for osx to do this auto­ma­gi­cal­ly. It uses the pre­instal­led com­mandli­ne tools »bc« and »sips«. I used Pla­ty­pus to make a (very basic) GUI‐​App for this script. Just drag your image fol­der on the apps main win­dow and every JPG, GIF an PNG will be resi­zed if necessa­ry. Feel free to sug­gest any impro­ve­ments. Hel­lo, I noti­ced that when I drop a fol­der onto this app, if the­re are any spaces in the fol­der name or fol­der path, it doesn’t work. Is this fix­able? Thanks so much! I can’t offer you a solu­ti­on right now, just a work­around. If you drag the images fol­der onto your desk­top, then on mmsi­zer it should work. This is how I do it. After­wards drag it back into the epub fol­der. First of all: thank you for this very han­dy uti­li­ty!! My ques­ti­on is: could/​would you be wil­ling to make a new ver­si­on whe­re the maxi­mum num­ber of pixels beco­mes 4.000.000 ins­tead of 2.000.000? Becau­se this has beco­me the new stan­dard for Apple after intro­du­cing the Reti­na dis­plays! Thanks in advan­ce! No Pro­blem at all. I’ll get to it short­ly. In my sear­ches I found a limit of 3.200.000 Mil­li­on pixels. Up from 2.000.000. Do you have a link?